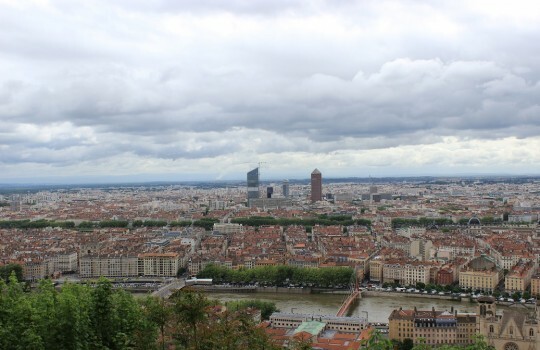 We visited Lyon in May 2015 with my girlfriend for her birthday. Having grown up around Paris and never actually visited Lyon, I was not quite sure what to expect from this city, except of course some great food and a nice sunny weather. Lyon was all that but so much more at the same time. 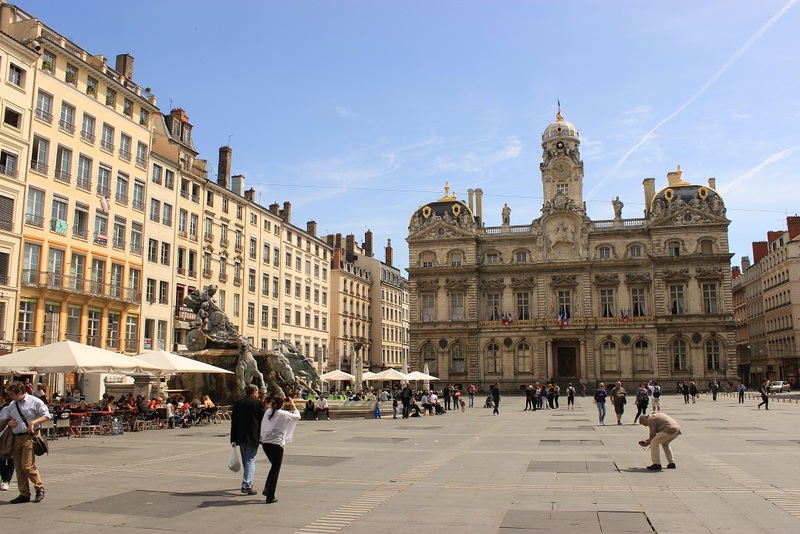 Lyon is a very lively city with an imposing history shining through its picturesque streets and monuments from all ages. Lyon subtly combines old and new in a dynamic ensemble that doesn’t feel stuck in the past like some other historical cities in Europe. There’s the Ancient Theatre dating back to the Roman Empire, the medieval Vieux Lyon quarter, the Basilica of Notre-Dame de Fourvière from the 18th century but also the Opéra Nouvel built just a bit more than a couple of decades ago. And, dotted here and there, let’s not forget the mysterious Traboules that undoubtedly were the highlight of this weekend in Lyon and spiced up the whole experience. We arrived by plane the day before (Friday) late in the evening and headed straight to our hotel (Best Western) on rue Mazenod just near the Pont Wilson for a good night sleep. On Saturday, we started our weekend in Lyon by visiting the old town (Vieux Lyon). We got up early and grabbed some delicious croissants on the way before crossing the Rhône and the Saône. The weather was perfect, sunny but not too warm with a delicious morning breeze to wake us up gently. We were quite surprised to see how empty the city was though. There is a nice market on the banks of the Rhône (Quai Victor Augagneur) but even there it was rather quiet. What we didn't know is that Lyon truly awakens later in the day and becomes a vibrant city in the evening with everyone out in cafes and restaurants enjoying the douce Joie de vivre of Southern France. In Vieux Lyon we first saw the imposing Palais de justice historique de Lyon and visited the Cathédrale Saint-Jean-Baptiste. We then wandered around the narrow streets of Quartier Saint-Jean (Saint-Jean quarter) with their medieval feel and architecture. Something not to miss in the Old Town are the famous Traboules, which are passageways through buildings to cross from one street to another. They were mainly used by merchants to transport their goods but also by the French Resistance to escape Nazi soldiers during World War II. Traboules sometimes have a very unique style and architecture that creates a special athmosphere when you visit them. In the Vieux Lyon, most of them are actually located in private buildings so you need to ring at the door to enter. This gives a very exciting and mysterious, almost clandestine, feel to the whole experience! You can visit this page for the complete list of Traboules in Vieux Lyon. For lunch we had some delicious quenelles de brochet (pike) and andouillette in a Bouchon Lyonnais, a type of traditional restaurant in Lyon celebrating convivial atmosphere and simple yet very tasty food. We went to Comptoir du Boeuf and really recommend it for the great quality and service! It's advised to reserve in advance as the terrasse quickly gets full after 13:00. In the afternoon, feeling heavy after lunch, we decided to remedy the situation by climbing the hill of Fourvière, nicknamed the Mystical Hill by Jules Michelet who wanted to emphasize the opposition between Fourvière 'the hill that prays' and la Croix-Rousse 'the hill that works'. 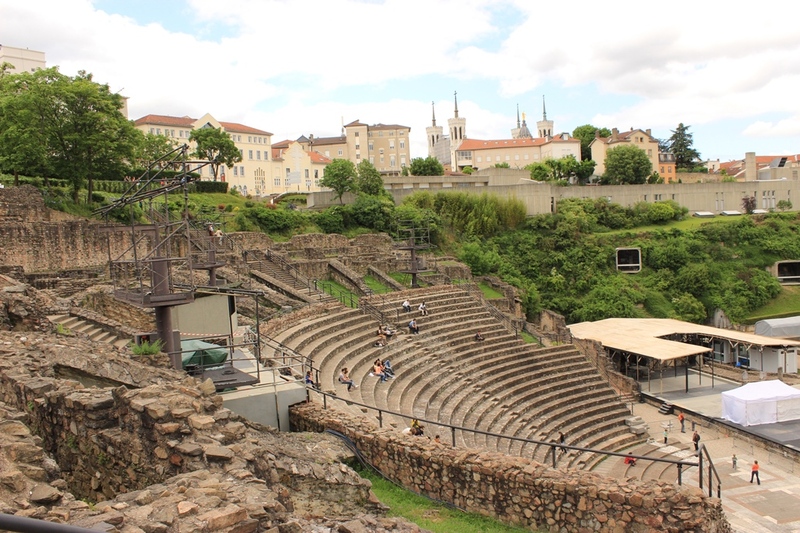 We visited the Théâtre antique de Lyon, the oldest theatre in France built by Augustus in 15 BC. Surprisingly the site has been well preserved through the ages and, although it's not as massive as what you would expect from a theatre that was welcoming more than ten thousands persons in 120, it's still rather impressive. The access to the ancient site is free but you have to pay to visit the Gallo-Roman Museum. After that we went to the Basilica of Notre-Dame de Fourvière, located a bit further uphill after the Ancient Theatre. With its Romanesque and Byzantine grand architecture, the basilica is quite stunning and rises above Lyon the same way the Sacré-Cœur dominates Paris. 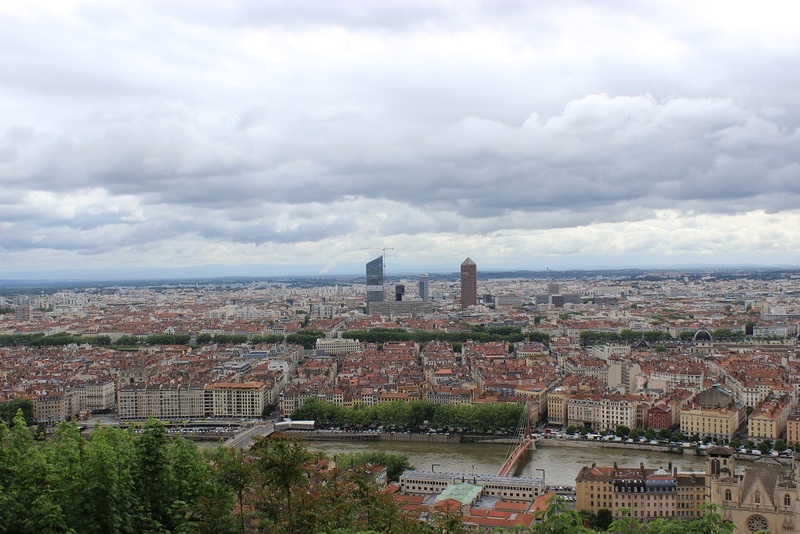 We then climbed down back to the Vieux Lyon by the Montée des Chazeaux and headed to Lyon's shopping center around Place Bellecour and rue de la République. In the evening we had dinner at the Terrasses de Lyon (Villa Florentine). The restaurant is located in Fourvière so we had to take the Montée des Chazeaux again but the way up this time, which was breathtaking, literally, with its 228 steps. Les Terrasses de Lyon is a one-star Michelin restaurant. We normally don't eat that fancy but being in Lyon, France's food capital, and celebrating a birthday, we made an exception. The dinner was delicious although I always find it difficult to get your money's worth when you pay so much for a meal! The highlight of the menu? Definitely, the Pigeon royal d’Anjou. The restaurant also offers a beautiful view of the city and, allegedly, the Mont-Blanc when the sky is clear. On the second day of this weekend in Lyon we repeated our now almost ritual of picking up croissants on the way and then headed to the Parc de la Tête d'Or, Lyon's largest park, to enjoy them on the grass in the sun. We walked around the lake of the park and visited the free zoo. 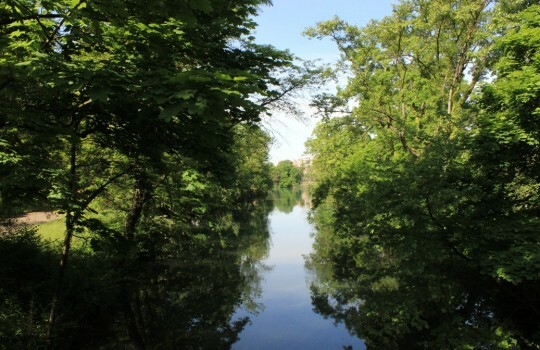 Although Lyon is certainly not the most oppressingly urban city with its cute streets and Rhône and the Saône passing through its heart, the Parc de la Tête d'Or is still a nice nature getaway within its walls. We then took the Pont Winston Churchill to reach Lyon's Croix-Rousse, nicknamed 'the hill that works' by Jules Michelet (see above) and, indeed, the quarter was an important landmark of the silk industry in Europe. 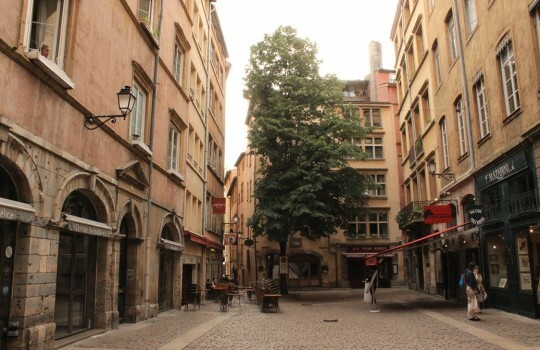 Because of this past, la Croix-Rousse features many Traboules just like in Vieux Lyon. The most famous Traboule is located at the junction of Colbert Square and rue Diderot. From there you can descend almost the whole quarter of Croix-Rousse by following this sign in each subsequent street. After this whole Traboule-treasure hunt, we took some rest and enjoyed a delicious cup of coffee at Café Mokxa - La Boîte à Café. We had lunch in Burgundy Lounge, a Bourgogne wine themed restaurant that provides a very exciting culinary experience: you pick your Burgundy wine and the chef arranges a surprise menu to match your selection. The wine was amazing, the food very decent and the ensemble reasonably priced so we would definitely recommend it! The only downside is that Burgundy Lounge doesn't have a terrasse so you cannot enjoy the sun at lunch. After lunch we continued exploring the 1st arrondissement for the last stroll of this weekend in Lyon. We walked past the Hôtel de Ville de Lyon, the relatively new Opera Nouvel built between 1985 and 1993, and the Paroisse Catholique Saint Nizier. We also wanted to visit the Musée des Beaux-Arts de Lyon (Fine Arts Museum) but we were a bit short on time and also thought it would be a waste of such beautiful sunny afternoon to spend it inside. We then slowly walked to Gare de la Part-Dieu to catch the Rhonexpress back to the airport. The ride takes 30 minutes and costs 25.70 euros. This 2-day weekend in Lyon was really lovely and gave us a good feel of the city and its different areas. Next time we come back we'll try to stay longer and use Lyon as a base to explore the surrounding nature that is supposed to be quite beautiful as well.